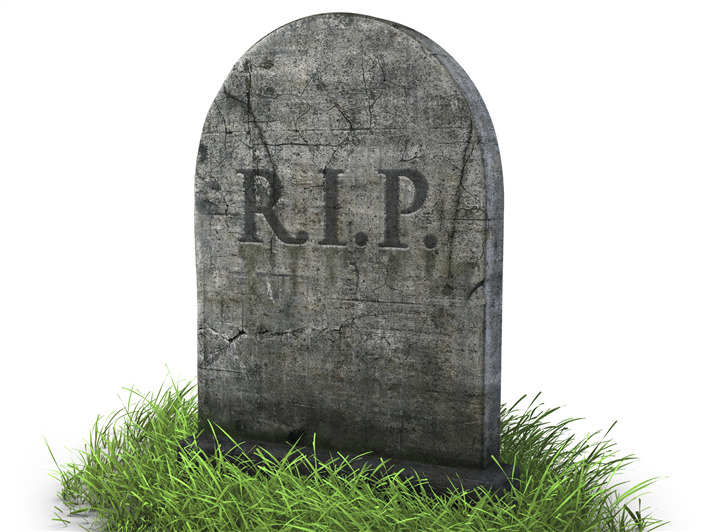 Editor's note. 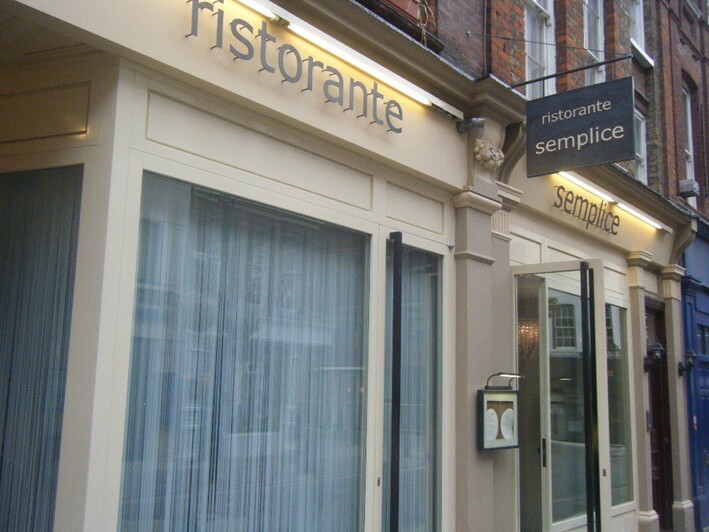 Semplice changed hands in September 2012, so treat the review below with the appropriate level of caution; there is a new chef and more casual format now in place, so the notes below are of historical interest only.. 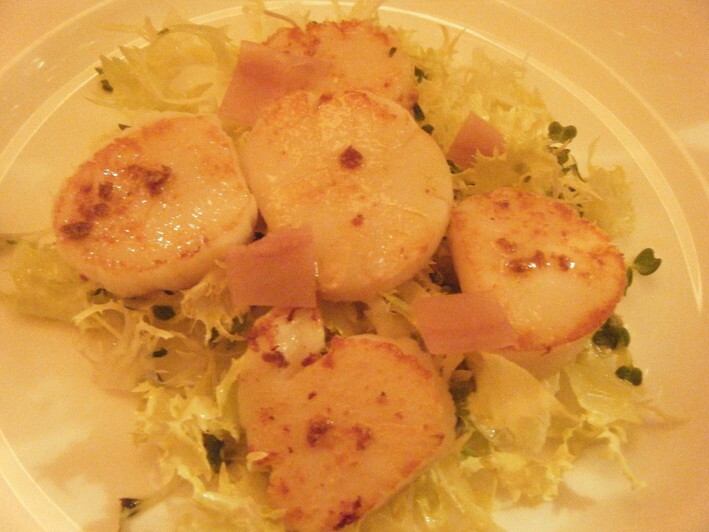 The meal began with a salad of diver scallops with candied ginger and aromatic Sarawak pepper. The scallops were cooked a fraction more than I really like, but were of good quality, the salad leaves were fresh and the pepper really was aromatic (14/20). Much better was a warm French bean salad with new potatoes and Parmesan. This was excellent, due to the terrific flavour of the French beans. Semplice get their fruit and veg from an importer who brings over the produce twice a week from Bologna, and indeed these beans tasted far better than you would expect from a UK restaurant. We shared an intermediate course of spaghetti, whose pasta had excellent texture, flavoured only with more of the Sarawak pepper and Tio Bore pecorino cheese (16/20). Pan-fried John Dory was served with a lovely, intense puree of Jerusalem artichokes and shredded sautéed mange tout. These had superb flavour (and were again imported from Italy). The fish itself was a cooked a little long and so was drier than it should be, and this is the only thing that let the dish down, since the puree and the mange tout were great (16/20). 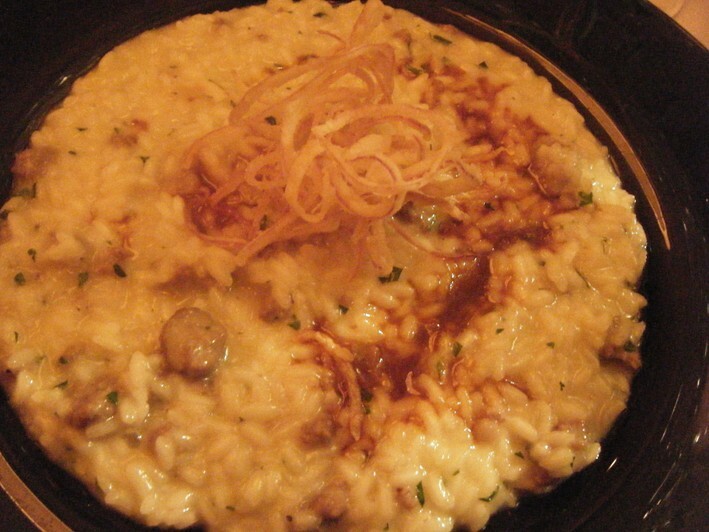 Risotto with Alba sausage was garnished with some deep fried red onions, a good idea as this cave a crisp texture contrast to the rich creaminess of the risotto. The risotto itself was very good, made with proper chicken stock, but the sausage itself I found rather tasteless (15/20). Bread was good, as before. Overall on the border between 15/20 and 16/20. Service was excellent. Below are notes from a meal in November 2007, by way of comparison. Semplice has a pleasant modern dining room, though tables are packed quite close together. Breads are Italian and fair in quality, but I found the texture a little too firm e.g. the focaccia was fine but not in the same league as the wonderfully soft, airy version made at Zafferano. For a starter I had spaghetti from Gragnano with black pepper and Tio Bore cheese. The pasta itself was excellent, with very nice texture, and the seasoning was good. From a presentation viewpoint the dish could have been improved with some kind of garnish, since a plain bowl of pasta with no colour does not look that appealing. However the taste is the main thing, and this was excellent (15/20). 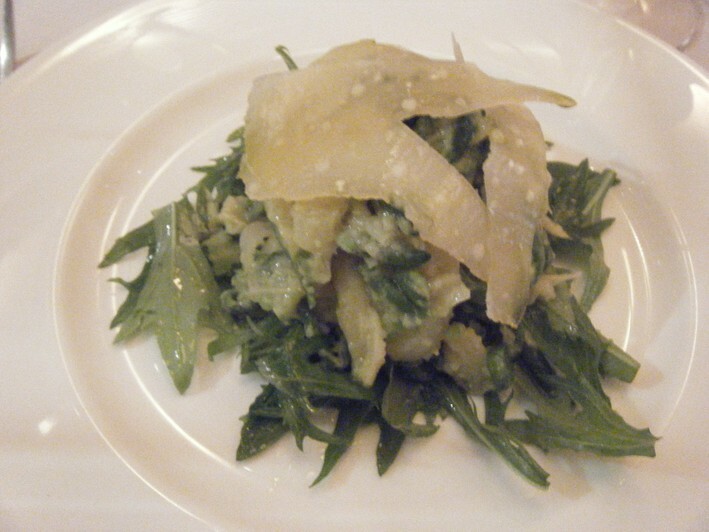 Even better was a superb salad of warm French beans with nicely cooked pieces of new potato and Parmesan; this was attractively presented and the elements of the dish were excellent, as well as working well together as a whole (16/20). 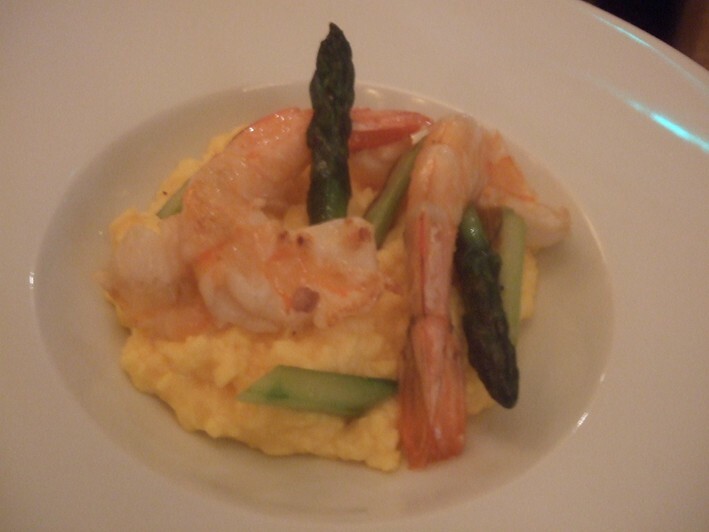 I tasted a less good starter scrambled eggs with prawns and asparagus, where the prawns were fine but the scrambled egg was rather carelessly made (maybe 13/20). 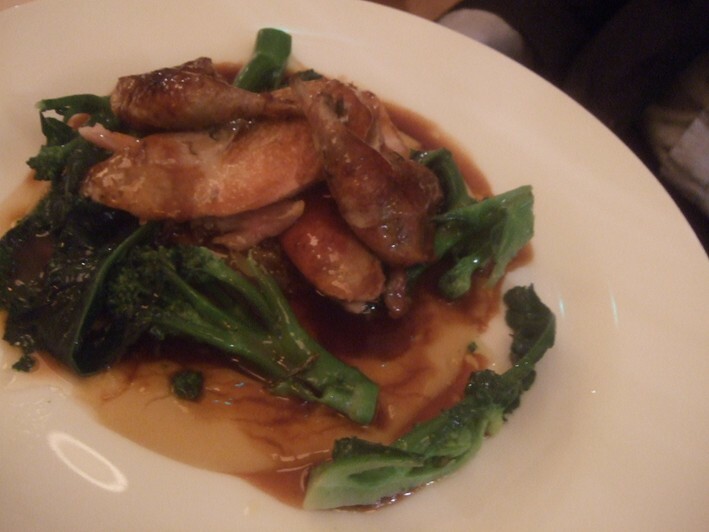 For main course I had a special of risotto of grouse. 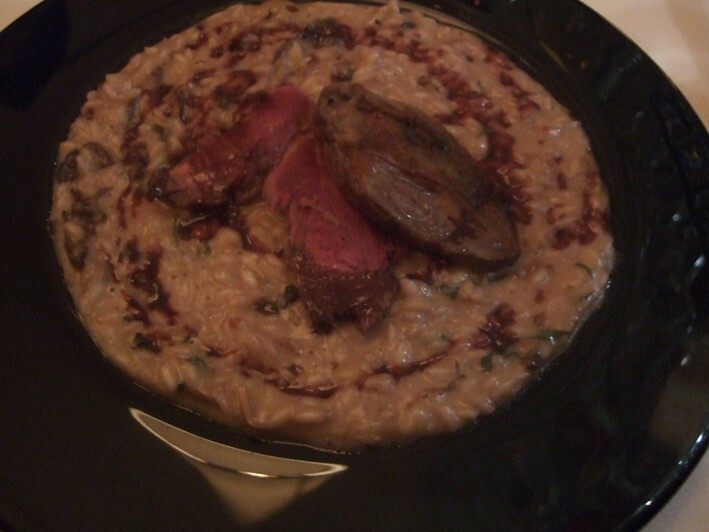 The grouse itself had robust taste and was tender, and the risotto was very good indeed. The stock used was excellent, the rice having nicely absorbed it and had that ideal texture where it is soft but still has a hint of firmness left (16/20). A fillet of red mullet with Jerusalem artichokes and parsley sauce was also good, as was tasty partridge with lovely well-timed broccoli and cannellini bean sauce. Desserts were a mixed affair. 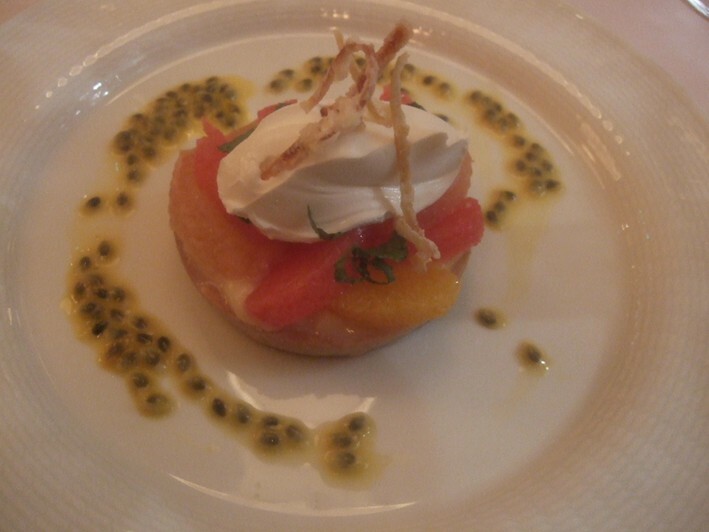 A citrus tart suffered from rock hard pastry, but the other desserts were fine. 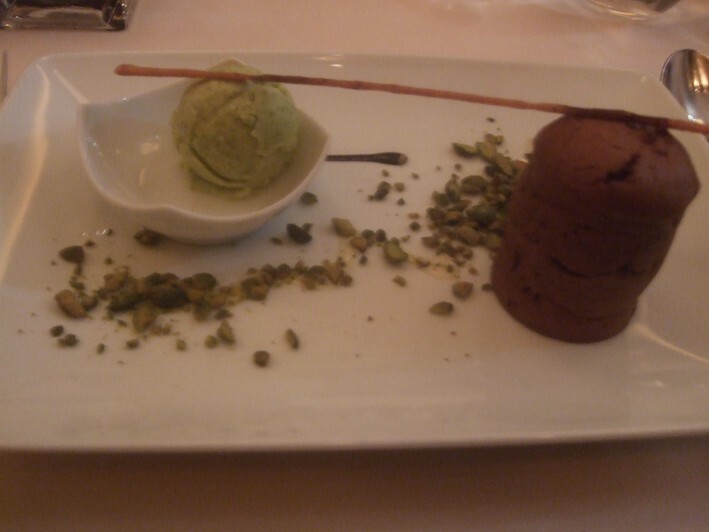 Domori chocolate fondant with pistachio ice cream had a rich, liquid centre and an outside that avoided any crustiness (16/20). Sorbets were also fine, with good flavour. Coffee was extremely good (17/20). The wine list is all Italian and this has a “fine wine" section for the indulgent. My favourite Jermann Vintage Tunina was available only in this section sadly, a 1998 vintage which is now £36 retail, but listed here at £125. However the sommelier was knowledgeable and steered us to some more reasonable choices. Service was good, friendly and with mostly capable topping up. Antipasti dishes are £8.50 - £11.50, pasta £9 - £11, main courses £16.50 - £21.50 (though vegetables are extra at £3.25 apiece) and desserts are mostly £6 - £8. Overall this impressed me, with just a couple of slips dragging the overall mark down to 15/20.